Aiken Spot Away Facial Cleanser! I have almost finished this tube of Aiken Spot Away Facial Cleanser & its time that I write a quick little review about it. Aiken is a Brand of Unza & that’s all I know about it because we don’t have Aiken brand officially distributed in Pakistan. Lets get on with the review I got it from Naheed Super store for Rs: 320 something for 100 grams. Purchased it because it has got tea tree oil in it, you all must be aware of the healing & amazing powers of tea tree oil. Thank God I don’t have acne prone skin but it sure is combination (oily) so I always am in the search for good oil controlling products. 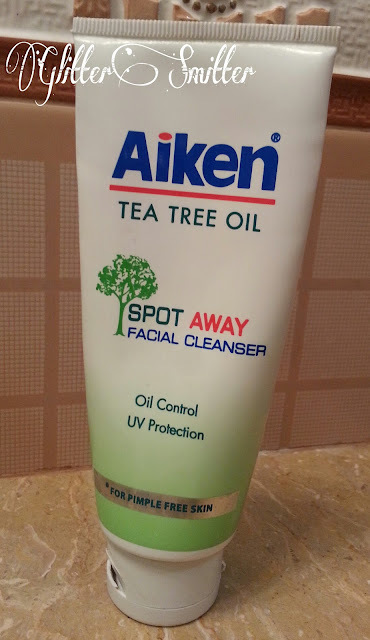 Today I am reviewing Aiken Spot Away Facial Cleanser as oil controller not as a pimple remover. Let’s get on with the review, shall we?